My views on a variety of topics. My slightly polemical side. What is the Future of Quebec? 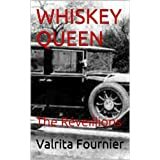 Please enjoy the gift of my book: Whiskey Queen, The Reveillions. In the Prohibition era, close to the Windsor-Detroit border, Liesse, a young French-Canadian widow with a disabled son, learns to draw from her inherited obsessive overdrive which is part and parcel of her whiskey making family. By confronting the demons of murderous sibling rivalry, misguided love & family bankruptcy, she has a Réveillions, an ‘awakening’. Love, business and the two men that want her will never be the same. She is taking the driver’s seat to save her famiy’s business and introduce a premium brand into the market! Enjoy, and please, if you are so inclined, write a short review on Amazon.ca. If you don’t like writing reviews, please don’t worry. I still would like you to read and enjoy my book. Thank you for visiting my author page and downloading my E-books! Hi I found your blog by researching for French-Canadian speakers in Michigan. My company is currently searching for native French-Canadian speakers who would be interested in participating in a voice recognition project. It basically involved of reading commands from a script in French-Canadian and checking if the software recognizes those command. I would be very grateful if you could pass along my information to anyone who speaks the language and is interested in participating. Each person is needed for approximately 4 hours and we offer great compensation. Let me know what your information is and I will let my social media contacts know.